I found a critter of some sort! What should I do? Is it an adult, and clearly hurt? Maybe a bird that hit a window or car, a turtle or squirrel that got run over? If the animal is clearly injured, but not so badly that you're sure it will die in just a few minutes, then call a wildlife rehabilitator. There are names and numbers at the bottom of this page. It is illegal for you to keep an animal or bird rescued from the wild. You must pass it on to the proper authorities or a licensed wildlife rehabilitator. IF IT IS A POSSIBLE RABIES VECTOR SPECIES SUCH AS A FOX, BAT, RACCOON, COYOTE OR SKUNK, DO NOT TOUCH OR APPROACH THE ANIMAL. STAY BACK AND OBSERVE ONLY FROM A SAFE DISTANCE. DO NOT LET YOUR DOG OR CAT NEAR THE ANIMAL. Is it a baby? Maybe a small bird or young deer or other young creature? The reason for that rule is that more often than not the mother or parents are somewhere near, and 'saving' it will take it away from natural proper care. The mother deer may be nearby, the fledgling bird being watched and fed by nearby adults. So how do you tell if that's the case? Watch the animal for a while. Staying way back and watching unobtrusively--and making sure that no pets bother it--you may see the mother return once she feels it's safe. If that's the case, then the animal didn't need rescuing after all. That is how the parent will be able to locate it. What if no mother comes after several hours? Then you may want to call a wildlife rehabilitator. He or she will probably ask you a lot of questions, such as where the animal is located, how long it has been alone, and other things that may help determine if intervention is needed. You can figure some of it our yourself with the two links below, which lead to decision trees. Each page also has information about how to deal with that specific kind of animal. Here is a link to a decision tree for dealing with a baby mammal. Here is a link to a decision tree for dealing with a baby bird. SO WHO SHOULD I CALL? For nuisance animals or a rehabilitator? 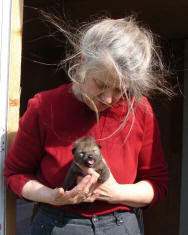 On or near Wellesley Island call Sue-Ryn Burns (pictured above with a baby coyote) at 315 482-2985 -this page is hers. If you get an answering machine or voice mail leave your name and a number where you can be reached, along with information as to where you are, what you found, and where and how you found it. Sue-Ryn has both NY State and Federal Wildlife rehab licences. To learn more about her wildlife rehab work click here. Here are some local NYS Licensed nuisance control people. All phone numbers in 315 area code unless noted. Rehabbers are prohibited by law from charging money - donations are always helpful. Nuisance Control people are allowed to charge money and many do. Because of recent cases of rabies in Jefferson County and on Wellesley Island, do not handle or even approach any baby or adult raccoons. Stay away from them and let them go their way. The same warning applies to skunks. If such an animal is acting aggressive, do not attempt to scare it off. Any mammal can get rabies, and only mammals such as raccoons, skunks, foxes, bats, dogs, cats—and people can get rabies. Animals with rabies act differently from healthy animals. They may move slowly or act as if they are tame. Some signs of rabies in animals are: changes in behavior, general sickness, problems swallowing, increased drooling, aggression, staggering, unusual daytime activity, weakness in hindquarters. Rabies can be prevented by the rabies vaccine, and through thorough cleaning of the would. If you are bitten by an animal that could have rabies, immediately clean the wound with soap and water for five minutes, and seek medical attention. Need help discouraging wildlife? Here's some.